Bayfront Fun! - 3 BR e 3 banheiros privativos com banheira de hidromassagem! Localização Localização! Esta casa modernista recém-nomeada reside diretamente na baía e fica a apenas três quarteirões a leste da cidade, longe o suficiente para saborear a calma e tranquilidade, mas apenas cinco minutos de compras e vida noturna. A casa também está em uma caminhada direta para o Oceano e suas vistas da Baía são espetaculares! A unidade possui portas de vidro deslizantes de nove pés que abrem dezesseis pés de largura, levando você do espaço para o amplo terraço de cedro Bayfront, é uma incrível experiência indoor / outdoor. A unidade possui portas de vidro deslizantes de nove pés que abrem dezesseis pés de largura, levando você do espaço para o amplo terraço de cedro Bayfront, é uma incrível experiência indoor / outdoor. Toda a unidade é recém-decorados com mobiliário novo, incluindo uma cozinha moderna com utensílios de aço inox e bancadas em granito. Todos os quartos desfrutam de mobiliário novo, ar condicionado dedicado e unidades de aquecimento. E não há necessidade de compartilhar seu banheiro com outros hóspedes, cada quarto vem com seu próprio banheiro privativo. Sente-se no convés da frente se você estiver em um clima social e se envolver com os passerbys, ou no lounge do quintal para a propriedade total incentiva você a abraçar seus caprichos. Você pode tomar banho ao ar livre em uma das barracas duplas chuveiro e tomar um banho de imersão na banheira de hidromassagem Bayfront. Ver as balsas transferir passageiros de e para a terra principal, e shuttle táxis aquáticos de e para os Pines. É uma experiência maravilhosa. Beautiful house very close to the ferry and all the hot spots. The guys were very attentive and made every effort to make us feel at home. The place was spotless and super comfortable for cooking out, watching a movie, and each bedroom has a tv and private bath so alone time is easy too. Beautiful home, perfect location, lovely hosts! We loved everything about this house--the location, the sunsets, the deck, the outdoor shower, the openness of the living room, and Robbie & Joe! The house was so clean and the bedrooms were very comfortable. The large open living room with the wall of windows was perfect for our friends and family to spend time together, and the sunsets from the hot tub were my favorite thing. The hosts, Robbie and Joe, could not have been nicer. The care they put into their house is obvious everywhere and they were very responsive to our questions and super thoughtful (thank you for the gift basket!). We had a blast! This place is amazing. It’s been newly renovated and looks even better than its photos. It’s super clean, the beds are very comfortable, and the kitchen is well equipped and makes cooking really easy. The location couldn’t be better. It’s close enough to the ferry docks and shopping and restaurants (just a few minutes) but far enough away to avoid any noise from the clubs. It’s also just a few minutes from the beach. Right out the back door is the bay, with incredible sunsets and views. The hosts were very considerate, providing not only a beautiful welcome basket, but also a kitchen stocked with essentials (olive oil, vinegar, spices, etc), and bathrooms stocked with shampoo, soap, and toilet paper. TVs galore! And an outdoor shower!! Honestly, we can’t recommend it enough. And this family of 5 (parents and adult children) can’t wait to return. This home is in a perfect location! It’s clean, comfortable and the sunsets are to die for! Couldn’t ask for better hosts! We would come back in a heartbeat! The owner was very helpful - whenever I had questions, he responded right away. The house was gorgeous and super clean and comfortable!! We were ready to party there but ended up staying and relaxing on the deck of the house a lot. Highly recommended! 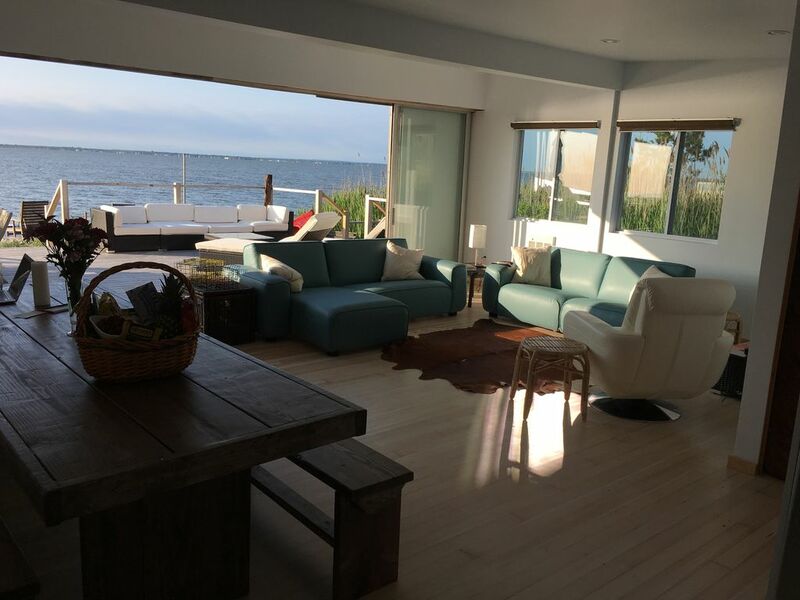 This was our first time on Fire Island, and we were glad to have such gracious and welcoming hosts in Robby and Joe. They answered questions in detail and promptly, came to meet us at the Ferry, gave us insights on things to do/go. The house itself is modern and was perfect for us, while the bedrooms could be considered small, it didn't matter as we spent most of our time on the deck or living room/kitchen area. We were less than 5 minutes from the beach, groceries, ice cream, pizza and really anything else we wanted. We look forward to staying with them again and will recommend it to friends. Thank you again Archana for taking such good care of our home and we would love to have you over for a glass of wine next time you're in town. Por favor, observe que o Cherry Grove não pode ser acessado de automóvel, você deve tomar o Saville Ferry ou táxi aquático.